Ignoring the constant background sound of cross-border gunfire and shelling that plague these villages Siramarg, a teacher fully devoted to her work, makes every effort to reach the Armenia-Azerbaijan border to be with her students. She leads one of the extracurricular hobby groups that FAR organizes in Berd City and its surrounding villages through its Breaking the Cycle of Poverty Program (BCPP). Siramarg lives in Berd City and she takes risks to travel the 20 kilometers to Movses and Aygepar to see her students. Often she has to walk at least part of the way; sometimes she waits for hours on the side of the road to hitch a ride from a passing car. Siramarg’s love and care for her students is evident and she rarely talks about her own hardships. After her husband’s death in 1998, she was left alone to raise her two children. As she says, FAR was her biggest supporter and best friend during this most difficult period of her life. 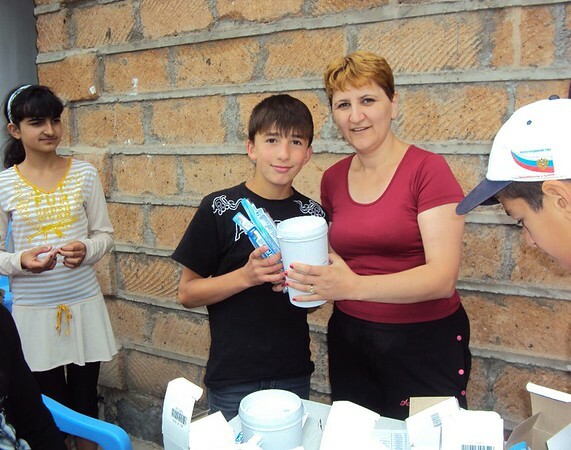 During those years her son Tigran became a beneficiary of FAR’s Children of Armenia Sponsorship Program (CASP), through which he received much-needed financial support until he turned 18. Tigran currently serves in the Armenian Army in Nagorno-Karabakh. Siramarg’s daughter Liana successfully competed for and won a FAR scholarship and graduated from Yerevan State Pedagogical University. Liana is now working as an Armenian language teacher in Berd. More than 50 children attend her painting classes on a regular basis. Siramarg is especially proud of the five exhibitions of the kids’ work, which were held over the past year, including one in Berd City. The best works now decorate the corridors and art classrooms of local community schools. The interest among the younger generation in the region toward the arts continues to grow so rapidly day by day that there is now a waiting list to join Siramarg’s classes.